This comic right here, holds the first appearance of the new Suicide Squad team. This is the incarnation that we will all be seeing on the silver screen in the next couple weeks. After the events in Crisis on Infintite Earths, DC gave John Ostrander the task of revamping the Suicide Squad from it's four hero, Mission Impossible style team, to the super villain, anti-hero team that we know it to be today. Ostrander came up with the idea of a government work release program for the super villains of the world. They would work highly secret, black ops missions to reduce time from their sentences, if they survived that is. This also explained why super villains were always seeming to "escape" from prison and return to their lives of crime. Ok, so now that we know a little about the new team, let's see which villains are on this new team. The new Task Force X is headed up by Amanda Waller and led by Rick Flag Jr., who is also a member of the original Suicide Squad team of the Silver Age. These two are the constants of the team. The remaining members of the Suicide Squad, in this issue at least, are Bronze Tiger, Deadshot, Enchantress, Captain Boomerang, and Blockbuster. Many of the members rotate through as they either fulfill their commitment and are released, or are ultimately killed while on the mission, like one member of the team does in this issue. Now, let's get into why this team was assembled in the first place. 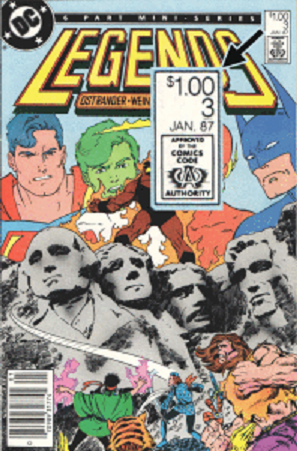 Brimstone, who is an agent of Darkseid, is threatening to destroy one of Americas landmarks, Mount Rushmore. Task Force X is sent in to stop that from happening. They create a diversion while Deadshot tries to get into a position where he can take the big baddie down with an experimental laser rifle. During the battle, Blockbuster is literally killed at the hands of Brimstone. He is scooped up in Brimstone's fiery hands, and then he drops his charred body at the feet of Captain Boomerang. In the end, Deadshot blasts his target and they defeat Brimstone. There aren't an a ton of graded copies listed on the CGC census. To date, there are only 1025 copies. But, of those copies, almost half of them are graded 9.8 NM/M and 3/4 of them are between grades 9.4 NM and 9.8 NM/M. To say there is an abundance of high grade copies out there is an understatement. 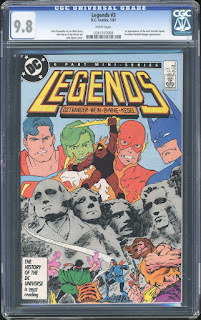 However, if you like autographed comics, there are 60 Signature Series copies out there as well. There was a huge surge in values shortly after the movie announcement, with some sales reaching near the $400 mark for 9.8 NM/M copies. Since then, values have slowly come back down and have settled into the low $100 - $120 range. If you're lucky, you may be able to snag a copy for less than $100. Most other grades have seen that same boost along with the slow decline like the 9.8 NM/M copies have. Whether this comic will get another boost after the movie is released still remains to be seen. I personally think that it will just continue to decline and settle at a value similar to what it was before the movie hype. Either way, I guess we'll see soon enough. For all of you rarity hunters out there, there is Canadian Edition to be on the look out for. It's pretty easy to spot, if you know what you're looking for. The U.S and Canadian Editions have very similar covers, but there is one small difference. The price in the upper right corner is $.75 for the U.S. Edition, and $1.00 for the Canadian Edition. It has an estimated print run of 6,620 copies according to this website. CGC does label this the Canadian Edition and so far, there are only three copies listed in the census. It is a very hard comic to find. If you're a fan of the Suicide Squad, you may want to pick up a copy of Legends #3, especially since values are coming down. If you're looking for an investment, you may want to pass on this book for now, or be on the lookout for the Canadian Edition. Whatever you are, collector or investor, I wish you luck on your hunt.